a. Could early questions have minimised the worst? Only five months into the war a highly unusual weather constellation befell the United Kingdom from the Midlands to the English Channel , and caused damage as if the bombing raids by the German Blitz had started, which actually commenced a few months later. Could this have been prevented if weather excesses and war activities would have been linked together stronger? Good questions and answers at the time would presumably have had an influence far beyond the German Blitz. But what was the case that should have raised the interest of meteorological science? England ’s southern coast, when the harbours from Southampton to Folkestone were covered by sea ice. General Frost crowned his present unlashing with the severest ice-storm that had struck the Kingdom in recorded history from January 27–29, which lasted for up to 48 hours in some places. It came with a lot of precipitation that fell as freezing rain, in other places with a lot of snow, and wind that piled up snow drifts of two meters and more. The prolonged ice storm was very destructive. This did not just have natural causes in that case man did contribute to weather conditions. From a scientific point of view it was a fairly confined incident, and not too difficult to regard it as an anthropogenic experiment. Massive naval forcing occurred on one hand and an extraordinary weather excesses on the other hand. Meteorology should have been aware of that then, and climatology should be able to explain it by now. ___The UK organised in the first war months about 120 convoys to North America with 2500 ships, and in return 450 ships in 22 convoys came from Halifax . Further 35 convoys sailed from Gibraltar or Sierra Leone comprised of 700 ships. All convoys were shielded by at least a small number of naval vessels. Merchant ships were successively armed with a 4.7 inch gun. Liverpool was the center of marine transport, and the January cold reigned in this region as well. __Many thousands of sea mines were rapidly laid by British and German forces alike. “British naval vessels are sowing some of the last mines needed to complete Great Britain ’s 30,000,000-pounds protective shield for east-coast shipping. The minefield extending from Kinnairds Head , Scotland , almost to the mouth of the Thames , is the most extensive field ever laid.” (NYT, Jan 11, 1940) For that time it certainly included a lot of exaggeration and misleading information, but it does not seem unrealistic that up to 10,000 or 20,000 sea mines were actually laid around Great Britain . The Strait of Dover was mined with 3000 sea mines in September where the Germans soon lost three of their U-Boats. __The threat of mining can be measured by the efforts undertaken to organise mine sweeping and counter measures. The British naval minesweeping branch requisitioned some 800 trawlers, drifters, whalers and fishing vessels. In December 1939 it was indicated that more than 100,000 men would be engaged in the sweeping of German mines in British sea-lanes (NYT, Dec 10, 1939). By the end of the year the sweeping force consisted of a searching force consisting of 150 trawlers and 100 drifters, and a clearing force with 16 fleet sweepers and 32 paddle sweepers (Elliot, p.31). __Arial bombing of merchant and naval ships, and protective measures by anti air craft guns became a daily feature, after the bombing ban on merchant vessels was lifted by the end of October 1939. Soon one German air squadron (Löwengeschwader) claimed to have attacked more than 200 war and merchant ships (Schmidt, 1991), and in December 1939 the British Admiralty had to admit that German planes had attacked 35 of its vessels within a period of three days, sinking 7 ships (NYT, Dec 21, 1939). Actually the German bomber strength had at that date was: 1,546 units. __“During the first six months of war an estimated number of 33 U-boats were destroyed in about 4,000 depth charge attacks” (Hackmann, 1984). Each attack possibly could mean that a few or many dozens of depth charges were dropped. The total number of depth charges dropped per month could easily reach the figure of 10,000. During the first four war months 20,000 to 40.000 explosions could have occurred below the sea surface. __Until the end of 1939 the Allies lost about 330 merchant vessels comprising a tonnage of 1 Million. __And there are of course the immense number of miles ploughed through the sea by many hundreds of vessels in surveillance, observation, training, and rescue matters, day after day, and those naval vessels that did not only navigate the sea but were also out at sea to shell other ships, coastal batteries and enemy airplanes. Not all of the mentioned accounting happened in the immediate vicinity of the British island, but what ever happened in the marine environment from Helsinki to the western approaches in the Atlantic, the UK was very much in the center of naval activities, and anyhow in the center of weather making for the European continent. The remarkable cold from Liverpool, the English Channel, up to the river delta of the Thames could have something to do with a huge change in the use of the marine environment since the war commenced. In this region such a situation can only be short lived as there is a permanent supply of warm water from the Atlantic . The English Channel, a 560 km long arm of the Atlantic, is relatively shallow, with an average depth of about 120 m (390 ft) at its widest part, reducing to a depth of about 45 m (148 ft) between Dover and Calais . That limits the replacement of water within a short period of time, as in the few months in question until mid January 1940. Although the conditions then, with record low temperatures and sea ice in Channel ports, any assumption of a link to the sudden increase of activities at, above and under the sea surface is not free of speculative elements, but should not be rejected outright. Too heavily the sea was suddenly churned. From their experience during WWI the British most of all feared the operation of the German U-boats in the Irish Sea and the English Channel. Not only were all available ships mobilised to control the sea area, but also sea mines had to be laid. Not less active was the French Navy, the fourth largest in the world, which took precautionary measures along the coast from Dunkirk to Ushant . In addition traffic to France increased manifold. Britain was to assist France and in early October 1939 when 158.000 men and 60.000 vehicles had been shipped across the Channel. The employment of the British Expeditionary Force was doubled until early 1940. That all meant a sudden increase of traffic in a sea area that did not any longer get a higher heat supply from the sun, but loosing more due to intensive ship navigation. Within the overall picture of the winter 1939/40 the weather in southern England and the sea water conditions in the English Channel is not such a big issue. On one hand General Frost loosened its grip on this area in February, as the warm water supply from the Atlantic continued to appear. 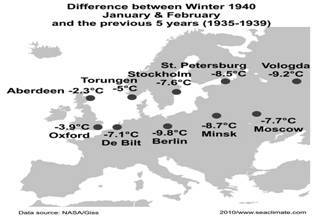 Even if after the war colder winters came in the 1960s, which does not necessarily exclude the January 1940 conditions in the UK as an interesting research subject on the contribution of war activities to these conditions. 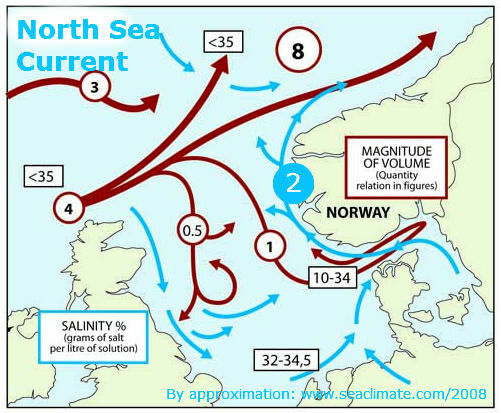 The core sea region for initiating the extreme winter is the North Sea because it took by far the heaviest burden of naval activities during the initial war months. It had been innumerable. Only limited numbers have found their way into the records. As they presumably went into many thousands, it is impossible to list them all. The interested reader is advised to consult other sources. 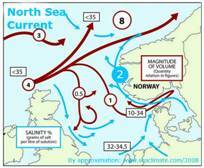 The North Sea is, with regrad to weather/climate, a more complex physical entity then the Baltic. The distinction between the North Sea (NS) and the Baltic Sea (BS) are numerous, which accounts for the influence on weather in Europe . __The NS is a part of the North Atlantic system, while the BS has only a small contact to the North Sea and is separated from the Atlantic by a high mountain ridge from Oslo to the North Cape . __The average salinity in the NS is 34 to 35psu ./. the BS with max about 15psu in deep water near the Danish Sounds, and very low at the head of Bothnian gulf. __The current in the NS is counter clock-wise, and influenced by tides with differences in wave amplitude between 0 to 8 metres and more. 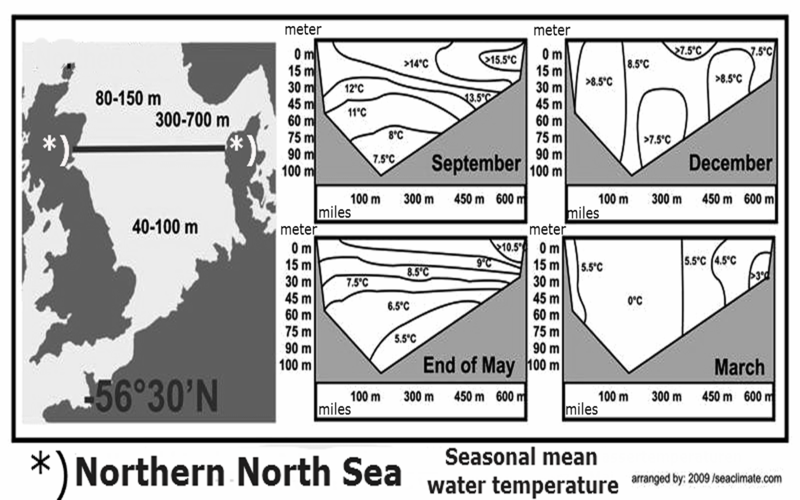 __The NS average temperature in summer is 17°C (63°F) and 6°C (43°F) in the winter. ___due to the bigger size of the NS, wind can cause higher waves and tides reach lower sea layers. ___the counter clockwise current and tides ensure a high water exchange and mixing between various water layers. ___Due to the very minimal ice cover in the NS, even under extreme cold winter conditions, the heat release to the atmosphere is never interrupted, as it would happen in the BS. In this very complex water body huge naval armadas were unlashed to inflict the most possible damage to the enemy. Not the smallest care was taken to protect the marine environment. No interest was shown to measure the environmental impact. 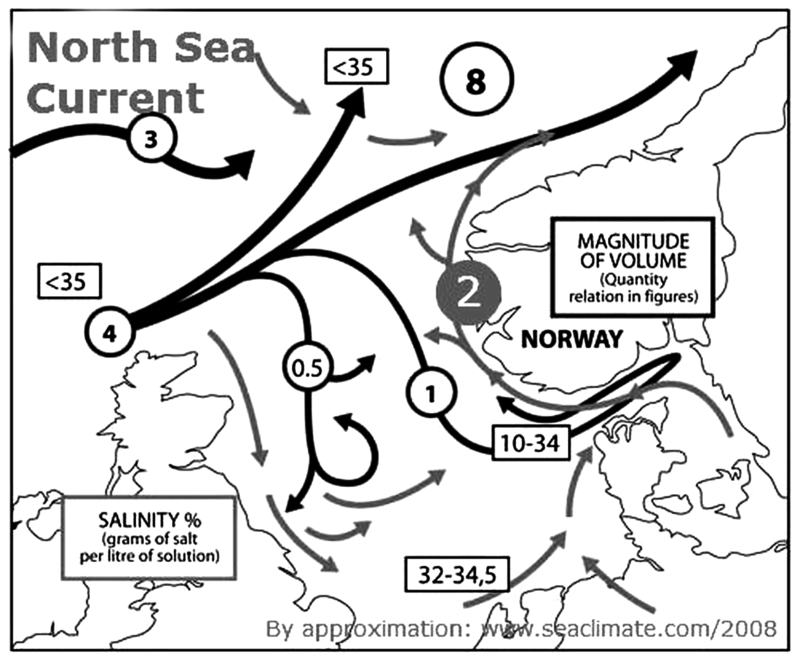 Not any data are available for evaluation of how the water body of the North Sea reacted to the situation, for example in January 1940 (see TM7, p. 93). The only evidential circumstances available are the facts that England was caught in exceptional weather conditions in January 1940, that countries bordering the eastern part of the North Sea experienced, unexpectedly, the coldest winter since the early 19th Century, and that huge naval forces swept through the waters around the UK like a dozen of winter storms from the North Atlantic. To underline the severity of the influence that naval force had on the water conditions in the North Sea in autumn 1939, this chapter is closed with another brief history of significant naval activities in the North Sea . · September 3-9, 1939 : Four U-boats drop magnetic mines in the estuaries of Orfordness, Flamborough, Hartlepool and the Downs sinking four vessels with a total of 16,000-tons and damaging one ship of 11,000-tons. · September 4, 1939: The British air force attacked the German fleet at the North Sea entrance to Kiel Canal (NYT, September 5 1939); “North Sea - 54 Blenheims and Wellingtons of RAF Bomber Command are deployed against German warships sighted in the North Sea” (Rohwer). · September 8, 1939: The Dutch Navy looses the minelayer Willem van den Zaan (1,270-tons) and the minesweeper Willem van Ewijk (460 tons) to its own mines (Rohwer). · September 8, 1939 : “A concentrated bombing attack on the heavily fortified German island of Sylt …. apparently was made today as one observer described, by ten to fifteen planes. Anti-aircraft guns fired, booming and explosions indicated that bombs were being dropped” (NYT, September 9 1939). · September 27, 1939: “Nazi Planes Raid the British Fleet”; “In the middle of the North Sea a squadron of British capital ships, together with an aircraft carrier, cruiser and destroyers, were attacked by about twenty German aircrafts. No British ship was hit and no British casualties were reported. One German flying boat was shot down and another is reported to have been badly damaged” (NYT, September 28 1939). · October 10, 1939; “Diving from a height of 5,000 feet and driven off by fierce anti-aircraft fire from multiple pompoms of a British cruiser squadron, German bombers battled for more than an hour in the North Sea yesterday …dropping 500-pound and 1,000-pound bombs (NYT, October 11 1939). · November 12, 1939: North Sea; in two different missions a total of seven German destroyers undertook mining operations off the central Thames delta, resulting in the sinking of two destroyers, one trawler and about 20 cargo vessels, respectively approximately 60,000 tons (Rohwer). · November 22, 1939 : Thirty-nine drifting mines seen near England (NYT, November 23 1939). · November 23, 1939: Mines sink 22 ships in six days (NYT, November 23 1939). · December 1, 1939 : England claimed to have mined an area of 300 square miles midway between the Schelde and Thames estuary. The freighter Sheaf Crest of 2,730 tons struck a mine and sank at a south coast town (NYT, December 1, 1939. · December 3, 1939 : “A British tanker was sunk by mines off the southeast coast of England …. She (San Calisto, 8,010 tons) struck two mines, which went off with such a force that the blast shook buildings on shore” (NYT, December 3, 1939). · December 4, 1939: “More than thirty mines were washed ashore on the Netherlands coast today, but were exploded by military patrols without damage” (NYT, December 4, 1939). · December 6, 1939 : German naval motor gliders drop 27 mines in the Humber and Thames estuaries (Rohwer). · December 17, 1939 : Four British destroyers laid 240 mines in the river Ems delta. · December 18, 1939: Driven away from the English coast, two German bombers dived out of the clouds on the 487-ton British motor ship Serenity today, riddled her decks with machine-gun fire and then dropped 18 bombs until one struck her amidships and sent her to the bottom of the sea (NYT, December 18, 1939). · December 19, 1939 : ‘Air Fleets fight off Helgoland ’. ‘34 down, say Nazi’. “The biggest air battle of the war occurred yesterday when British bombers encountered German pursuit ships over Helgoland Bight.” (NYT, December 19, 1939). The losses are 12 planes out of 24 RAF Wellington bombers deployed. · December 30, 1939: The small village of Huisduinen near denHelder was severely affected by a drifting mine, presumably of the Netherlands , which exploded after being washed ashore at 7 o’clock this morning” (NYT, December 31, 1939). 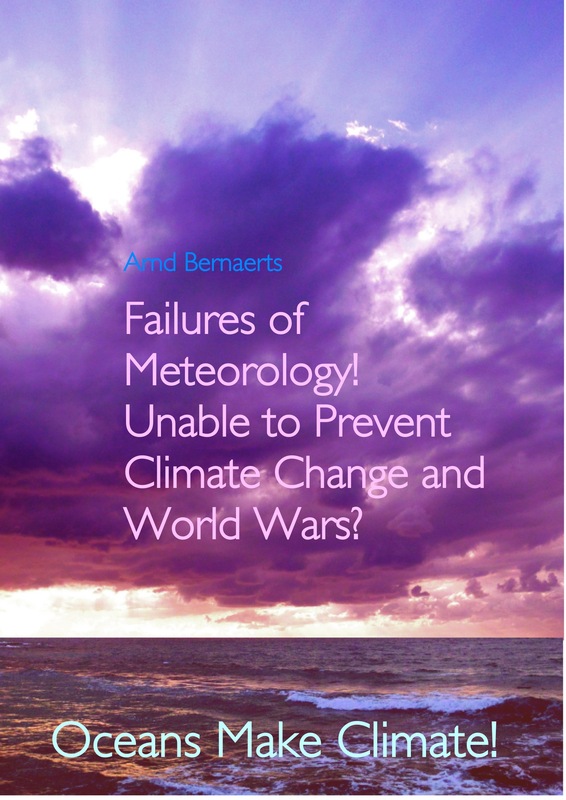 That meteorologists and their companions from the climate department ignore effects of the multiple assaults on the marine environment by many thousand incidents and on weather conditions in autumn 1939 and the subsequent winter, this is nothing that weather experts can be proud of. 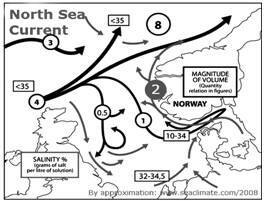 One of the greatest influences on climate of Europe is the Atlantic Ocean and especially the North Atlantic Current, which brings warm water from the Gulf of Mexico to waters around Great Britain , the North Sea, and up to the Arctic Ocean . This influences the generation of cyclones and wind moving from west to east via western and central Europe, and releases the moisture picked up over the Atlantic across the continent, more in the west and less further east. This has a powerful moderating and warming effect on the country's climate—the North Atlantic current system ( Gulf Stream ) warms the European climate to such a great extent that if the current did not exist then temperatures in winter would be about 10°C to 15°C lower than they are today. The closer to the Atlantic the most common winds are from the west or south-west. All of that was suddenly no longer true. The dominating effect of the Atlantic ceased. The move of cyclones and wind was blocked from entering the continent (see: C6). Instead the cyclones moved to the Barents Sea, or into the Mediterranean . The prevailing wind shifted from south-west to north-east. Rain fell in the west and less further inland. The investigation indicates that two factors contributed for this to happen, rain early in autumn, and the naval war in all sea areas in Northern Europe . How extreme temperature anomalies showed up, and the deviation across Europe was structured are subject of the next two sections. 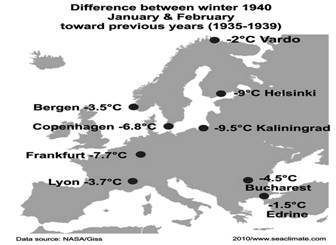 As already mentioned earlier that the winter 1939/40 was special compared to pervious extreme winters (and 1946/47) because its the length with low figures. Geiger noted (A2d, p. 6f) that a deviation of 6° for a month is unusual, but for a winter it is monstrous. What is not less stunning is that the war winter presumably generated the highest deviation from previous years. At least a calculation done for Berlin-Tempelhof can be interpreted in this way. 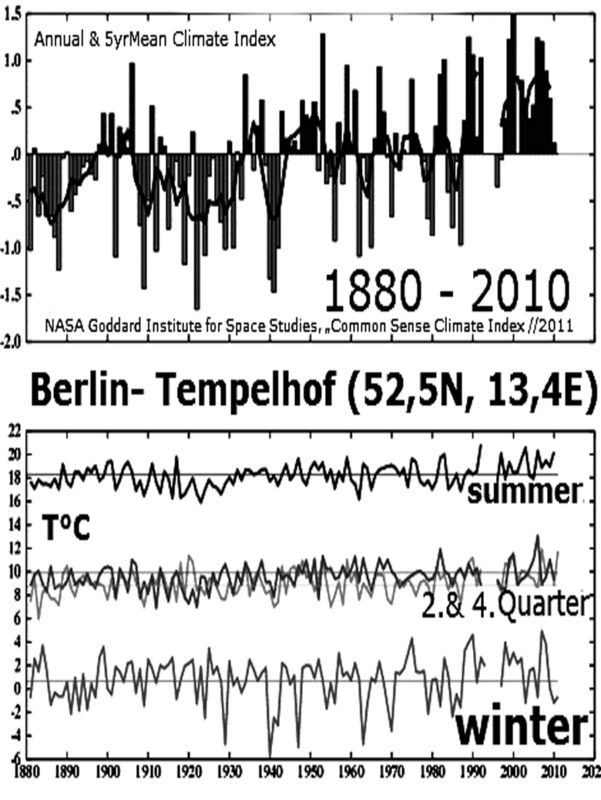 Covering temperature data since 1701 it is one of the longest records available. 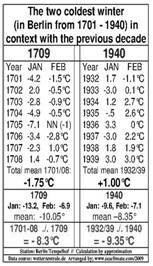 The period around 1700 belongs to the coldest during the Little Ice Age (LIA), since about 1550 to 1850. 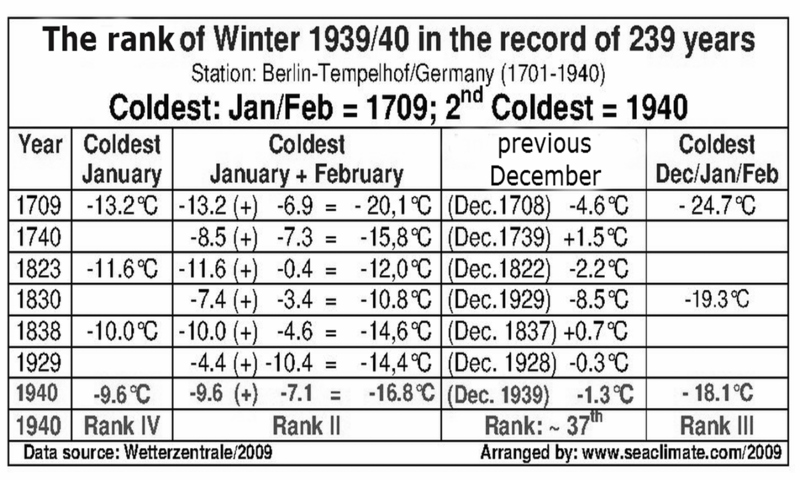 For Berlin , at the station Tempelhof, the winter 1939/40 ranks near the top for the coldest winter. The attached Figure C8-6 indicates the position in four scenarios. In the section of the core two winter months January and February are on rank two. With regard to the winter month December the winter 1939/40 ranks only on place 37, but combined with the following January & February 1940 the winter is on rank three (most right column in Fig. C8-6: “Coldest Dec/Jan/Feb”). This result is to be seen under the general conditions of the LIA when the mean temperatures had been lower, a further consideration shall be undertaken. The remarkable result does not necessarily reflect the ‘relevant’ picture. Under ‘relevant’ it is understood what the deviation actually meant to the biosphere and the people. 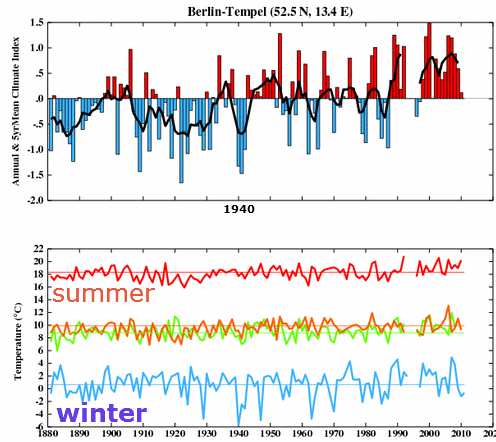 How high did the temperature divert form the level in previous years? 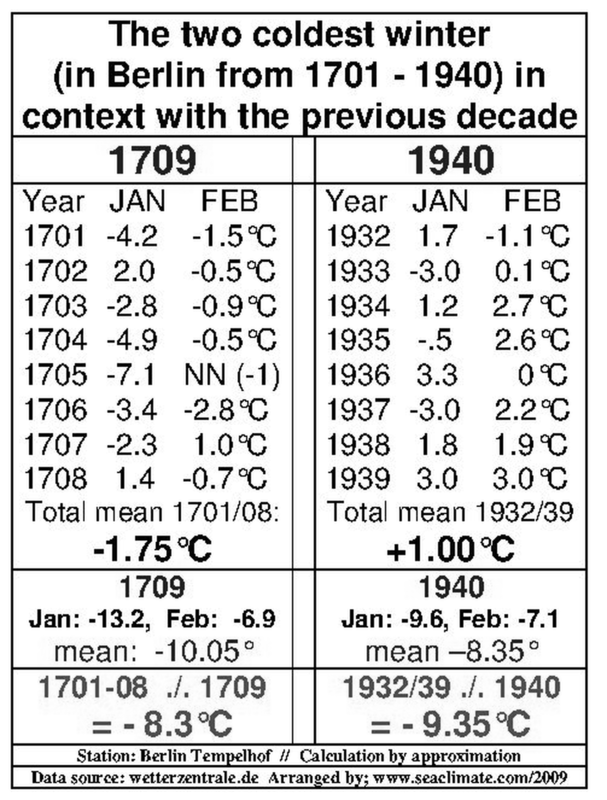 For this reason a mean for the months January and February over the previous decade from 1701 to 1708, and from 1932 to 1939 has been calculated, as shown in Figure C8-7. Although the absolute temperature figure for 1709 succeeds the figure for 1940 by 1.7°C, but if put in context with the previous decade (1701-08 vs 1932-39) the figures for the winter 1940 prevail over those from 1709 by the remarkable amount of 1°C. Two successive winter months are on average 1°C colder as the next coldest period demonstrates the extreme exceptionality of this war winter. It is easy to make general assertions. It had been also done here in a previous section by stating: “On an annual basis one could say: over three war years 1940-42 the world was warm, only Europe was severely cold.” That is true and could be proven by a NASA map TK4, upper image, “Dec/Jan/Feb”, p. 45), but it tells little about the causes, and that is what I want to talk about. 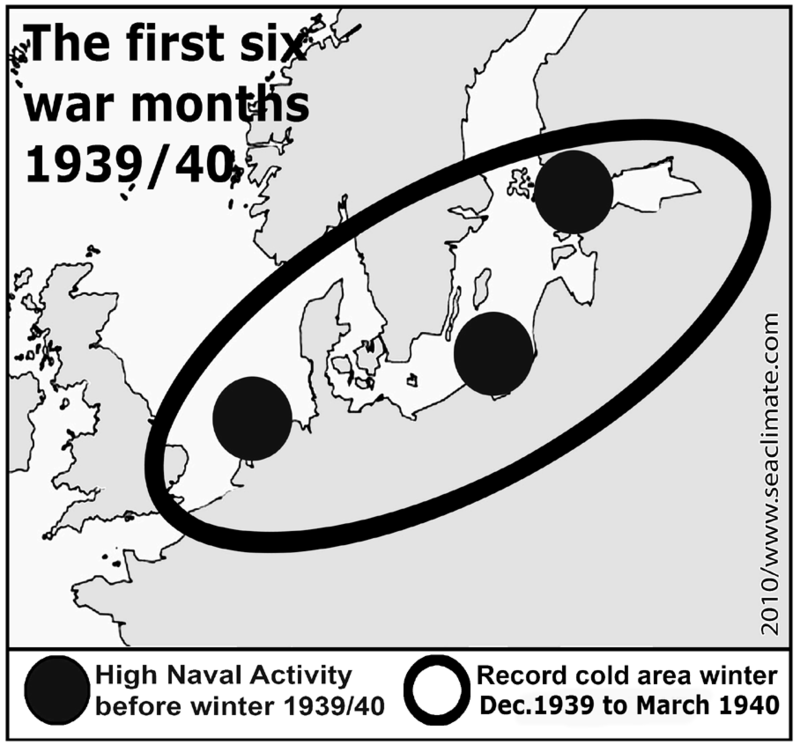 How it can be proven that naval war contributed to the extreme cold winter? A basic element in this chain is precision. The stronger the correlation in a world of chance, the closer one gets to evidence, or at least a prima facie evidence. Ideally we seek “empirical evidence”, that is the basic practice of science, which relies on direct experience. Here the direct experiment was naval war in the sea of Europe . That it actually the most horrible enterprise man ever undertook, and that it had been initiated by a bunch of criminal lunatics, does not disqualify the action as an anthropogenic experiment in the marine environment. Perhaps it may disqualify those researchers who are not able to see the need to investigate the correlation between the exceptional war winter and the numerous warfare activities simultaneously. Although there had been many thousands of naval activities from the Eastern Atlantic to the North Cape and Leningrad, there had been three regions, which saw the bulk of naval activities during the last four months in 1939 (Fig. C1-2 and C8-1), namely for four months in the German Bight and the southern Baltic, and during December in the Gulf of Finland . 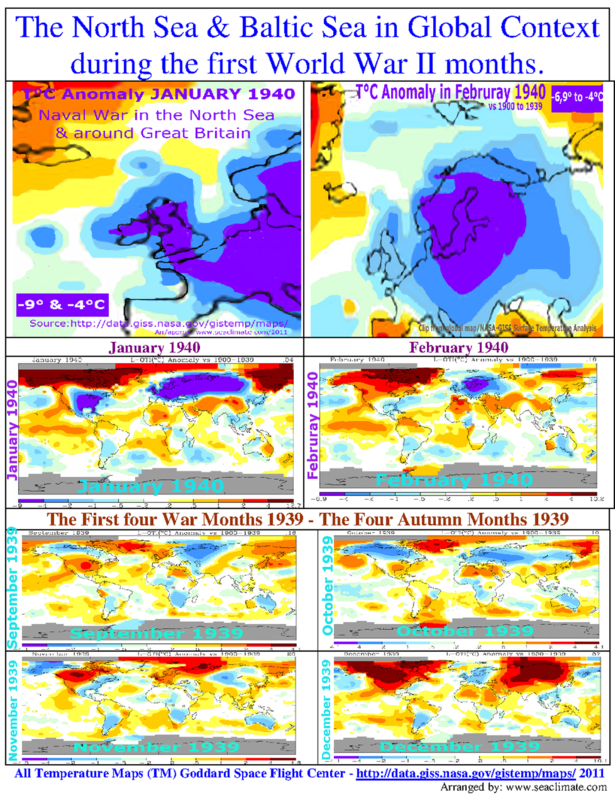 If one now compares this basic situation with a global map of temperature anomaly in winter 1939/40, (TM4), the region of cold from the eastern North Sea , and the entire Baltic, is identical with the main activity areas. The north-eastward extension up to Murmansk has something to do with the general global air circulation, respectively with the ‘west wind zone’ as shown in TM4. Even if one remains sceptical about whether, any information taken from the image would pass an in-depth scrutiny, the overall trend indicated can hardly be questioned. That means particularly that the winter 1939/40 all over the Northern Hemisphere had been unusually warm, like the previous decade during the 1930s, only Europe in general, and the Baltic region became the cold-pool of the winter. A further detailed analysis confirms the close correlation between naval war activities and the cold-corridor across Europe . 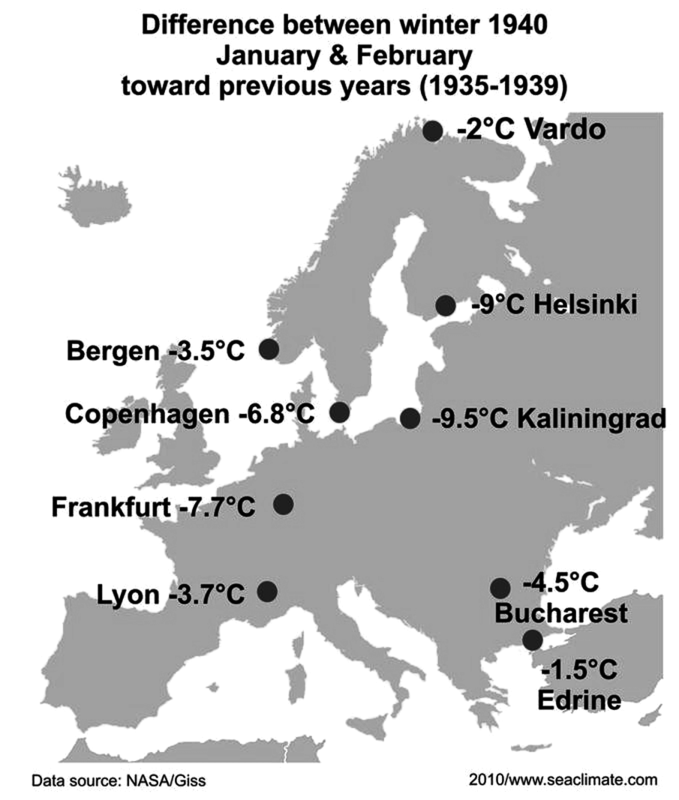 For this purpose the temperatures for January and February 1940 have been compared with previous data from 1935-1939, and placed along a west-east corridor (Figure C8-8), and a north-south across Europe (C8-9). Both graphics show clearly that the center of cold stretched from the southern North Sea, via a corridor from Oslo and Frankfurt/M north-eastwards to Murmansk and Moscow , where the anomaly lost its strength, the further east one looks. The north–south Figure C8-9 shows that the Mediterranean and the region between the North Cape and Spitsbergen were close to normal. Also the North Atlantic is far away from being caught in an anomaly, and the cyclonic activities had been within the usual range, as it could be concluded from a work by Bhend (above: A2h). A cold corridor from west to east as outlined in Figure C8-8 is not only impressive by the low temperatures along the upper and lower line along the path, but the clear indication that the middle line of the cold corridor goes from the southern North Sea, via the German Bight, to the southern Baltic eastwards. The role of the sea is thus exemplified. Along this line a number of all time cold records happened, in Poland already in January, in Hamburg in February (see Fig. C1-5, p.44), and the impact it had in Berlin is indicated in Fig. C8-5 to C8-7, above). On several levels an evidential close correlation between the center of the lowest temperatures, and the main areas of naval warfare activities could be determined. A clear presentation of the relevant data in a graphical manner underlines the relevance. This is clearly described by the 'cold corridor' extending from England , via the Baltic further eastwards. The correlation is so close and narrow that any claim that it happened due to ‘natural variability’ needs to be regarded as ill founded. Also a scientist’s claim referring to ‘natural variability’ has to provide proof in order to be correct. Too compelling is the example Berlin , which completed in the first war winter the coldest winter since 1701. The winter of 1939/1940 had physical reasons that point to unusual autumn and winter conditions in Western Europe 's maritime areas, to which naval warfare has contributed. The naval war thesis is strongly supported by the information presented, and can be considered as a prima facie evidence. According wikipedia: “The German Blitz started on March 16, 1940 , when the Luftwaffe launched a strike against the British navy yard at Scapa Flow/Scotland leading to the first British civilian death.” Bombing raids without civilian casualties started much earlier October 17, 1939 : “Nazi bomb naval base in Scotland ”. “About a dozen German planes yesterday, raining bombs on British naval vessels lying in the Firth of Forth near Rosyth , Scotland" (NYT, October 17, 1939).